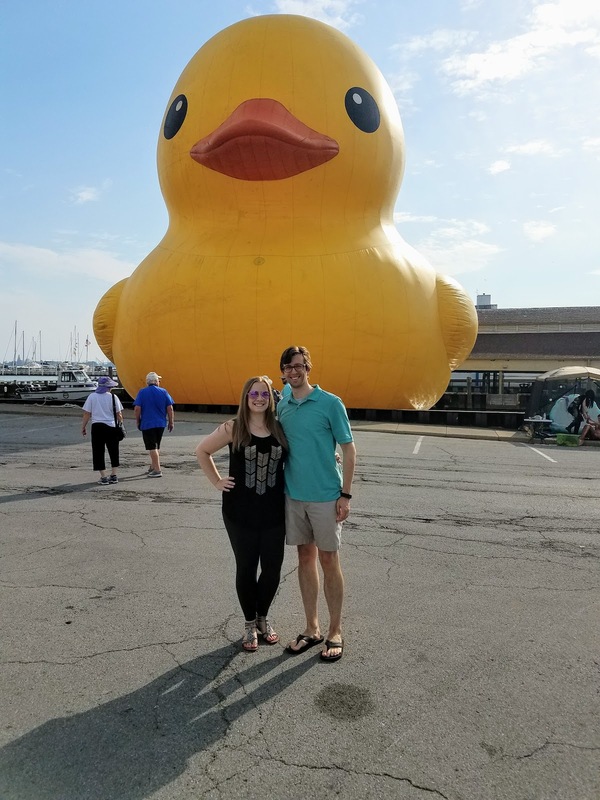 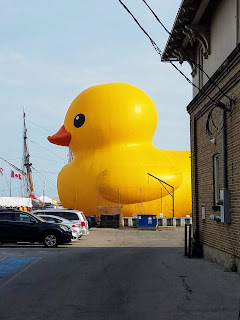 The Festival of Sail in Sandusky, Ohio had a massive increase in popularity this year due to the addition of the travelling Mama Duck (largest rubber duck in the world) who made Lake Erie her bathtub for four days in Northwest Ohio. Due to my constant Googling of the weather in Sandusky for the weekend and the details of this Festival I've had ads showing up to me constantly and the distances people drove to attend are astounding -- I've seen multiple people comment about 8+ hour drives just to visit Sandusky for Mama Duck. 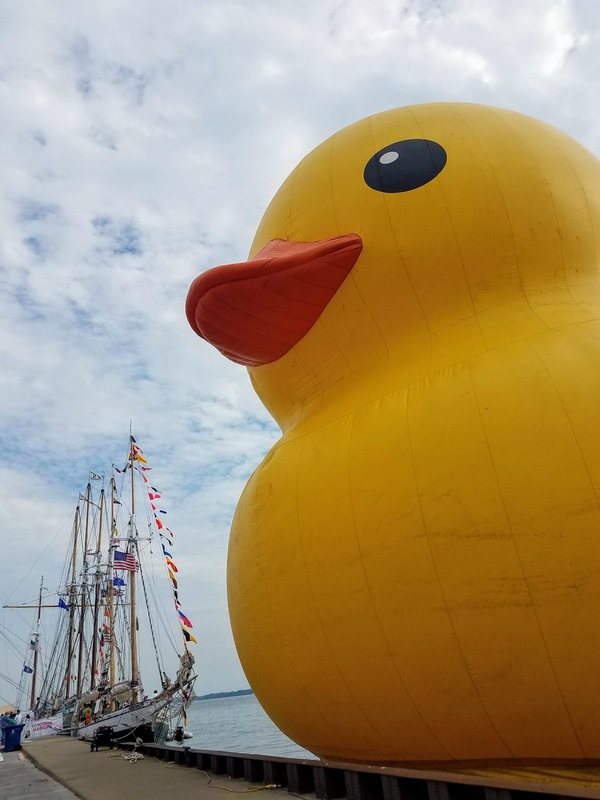 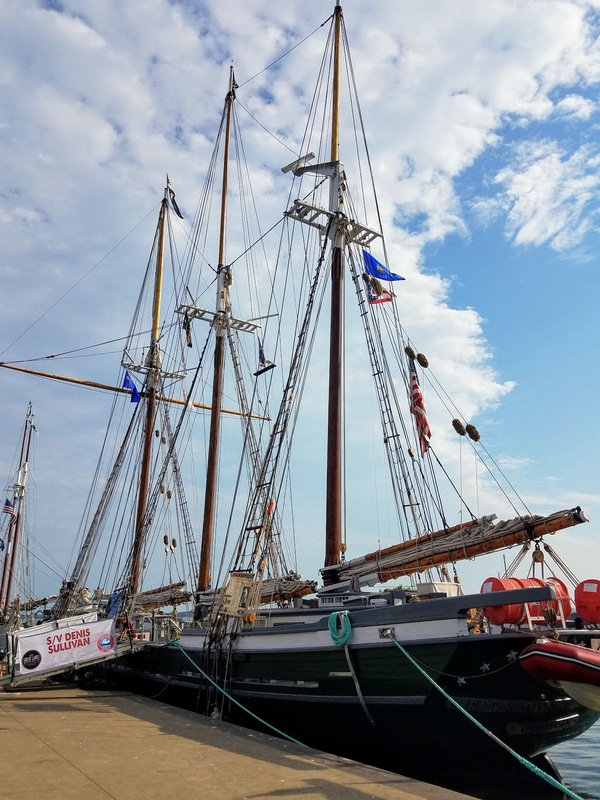 The Festival of Sail is still going on now and this is the last day to visit the ships and Mama Duck before they all head off. 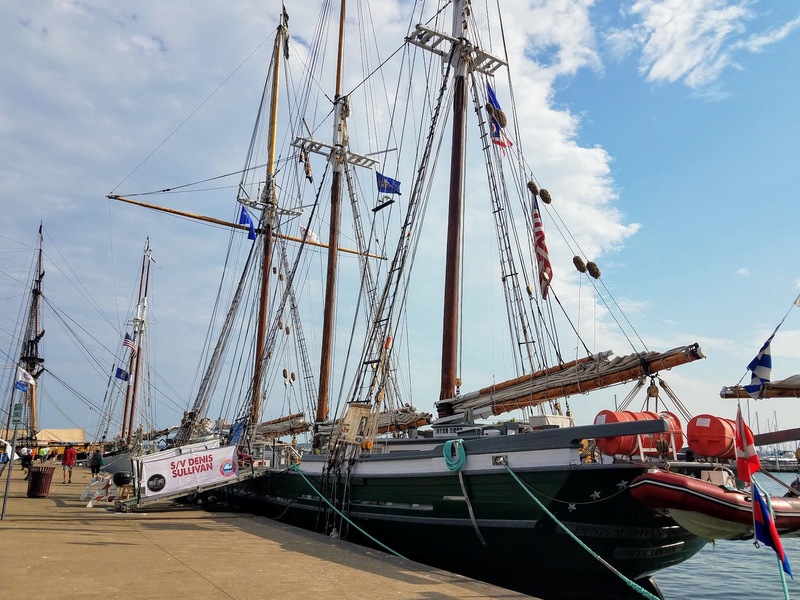 The event was slated for July 12-15 and hours varied from 11am-7 pm to 9am-5pm. 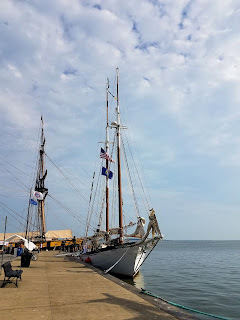 Due to Sandusky being an hour and a half away from us and our crazy schedule this week our only opportunity to head out to Sandusky was Saturday morning and I considered it a must on our to-do list. 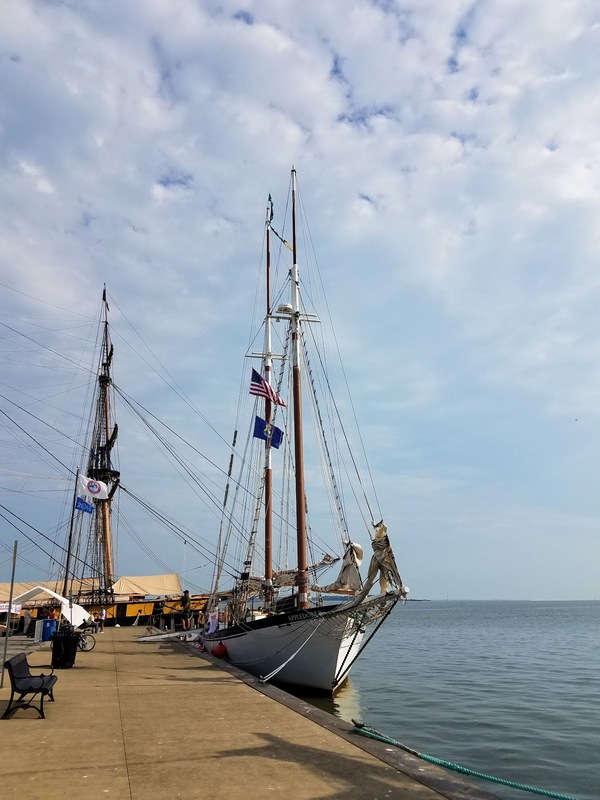 We arrived in Sandusky at 8:50 am and had zero issues with parking and the free street parking was plentiful at that time of day. 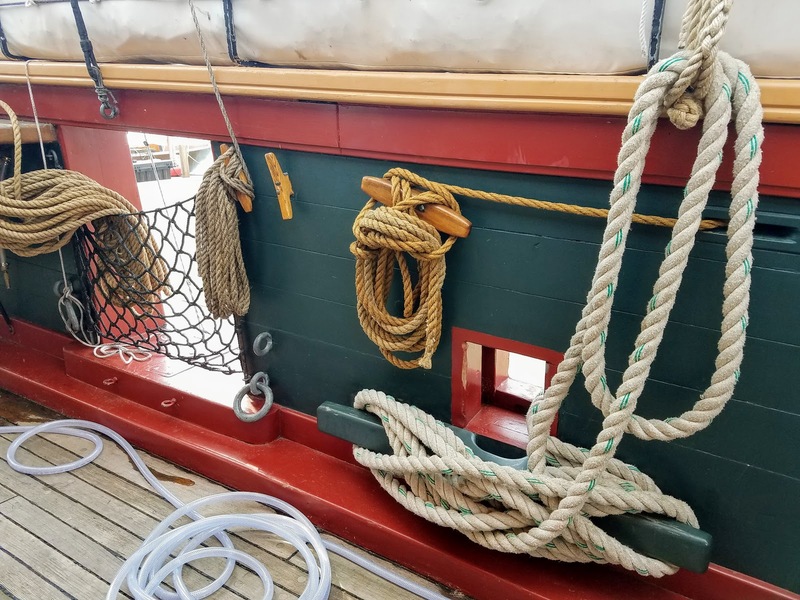 In order to expedite the entrance process we pre-purchased tickets with both festival entry and on-board tour options. 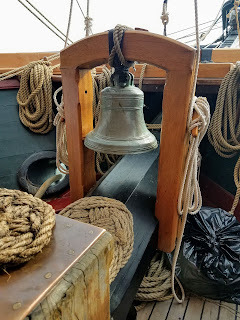 Due to time constraints we weren't able to participate in any of the day sail tickets (for a 90 minute sail). 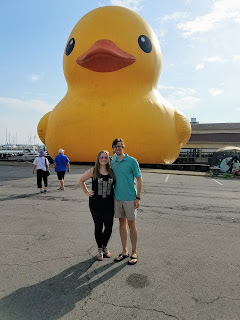 There was a small line when we arrived, but the festival for the most part was pretty empty at 9:00 am on Saturday which we had hoped for so that we could take cool photos of Mama Duck and maximize the limited amount of time we had in the area before heading back home. 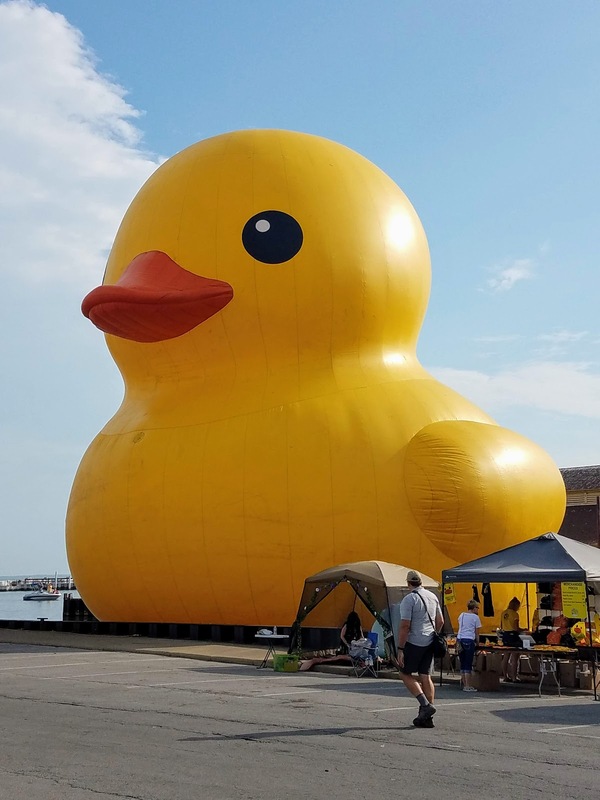 There is a fee to enter the festival ($10 for general admittance without the option to board the ships), but Mama Duck can be clearly seen from the street and from the edge of the pier outside of the barricades set up for the festival. Mama Duck from the street. 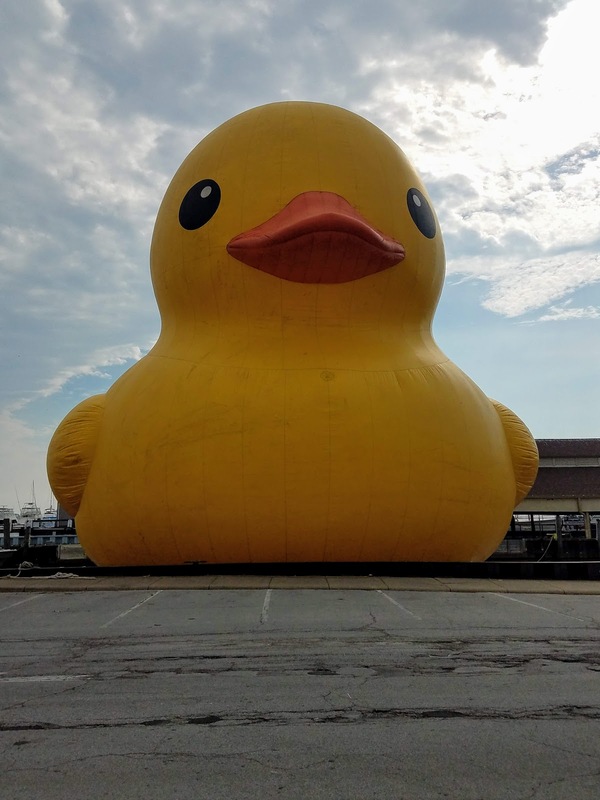 For reference Mama Duck is about 61 feet tall and 68 feet wide (the approximate height of a six story building). 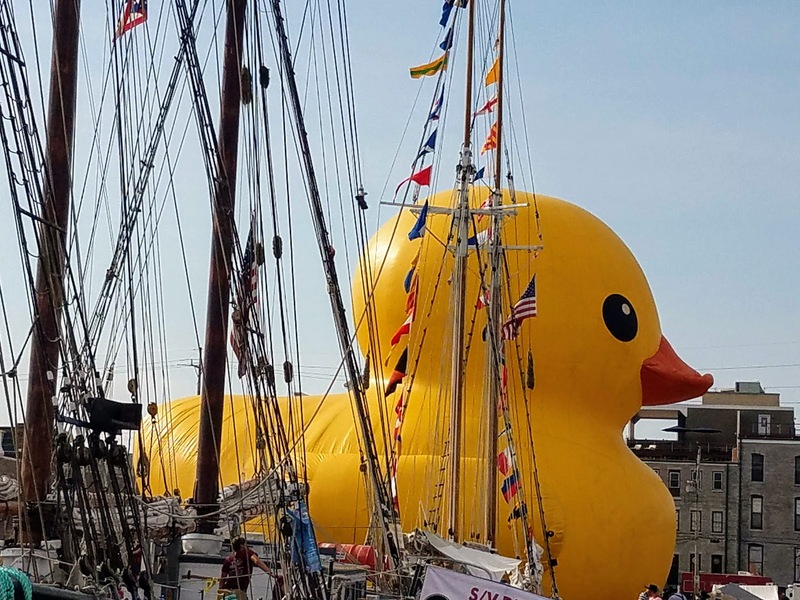 I have no explanation for the amount of joy this duck brings me, but seeing this massive yellow duck made me giddy. 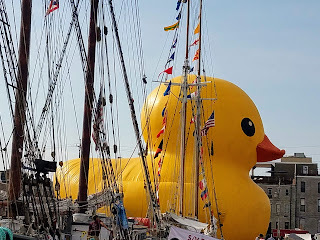 Aside from the sheer size and the fact that people, cars, and other objects are dwarfed in her wake, Mama Duck is really pretty simple and the simplicity and reminder of childhood is endearing. 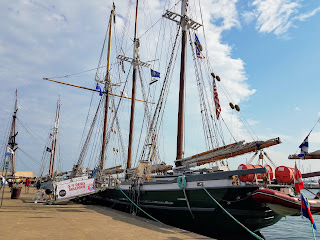 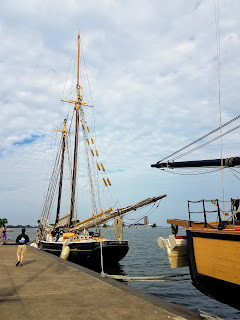 Stationed with Mama Duck around the perimeter of the pier are five historic tall ships: U.S. Brig Niagara; Schooner Madeline; Appledore IV; Lettie G. Howard; and S/V Denis Sullivan. 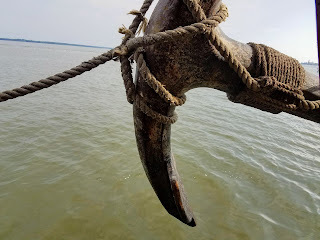 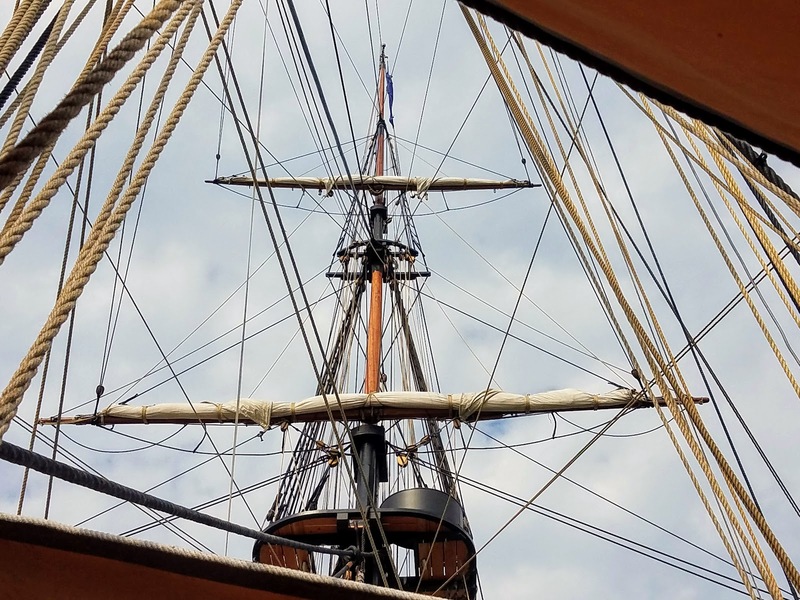 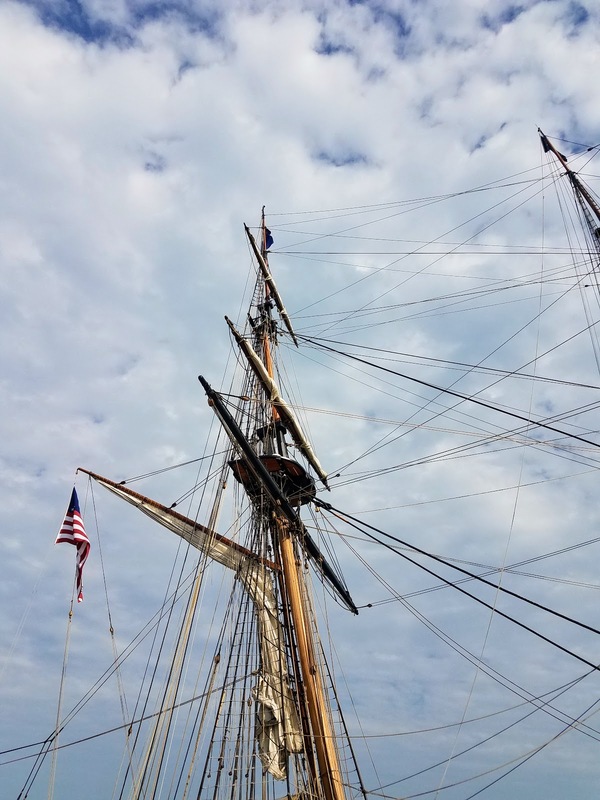 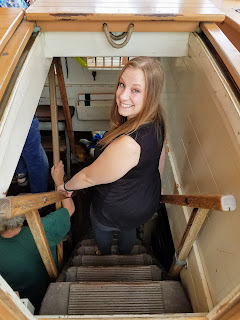 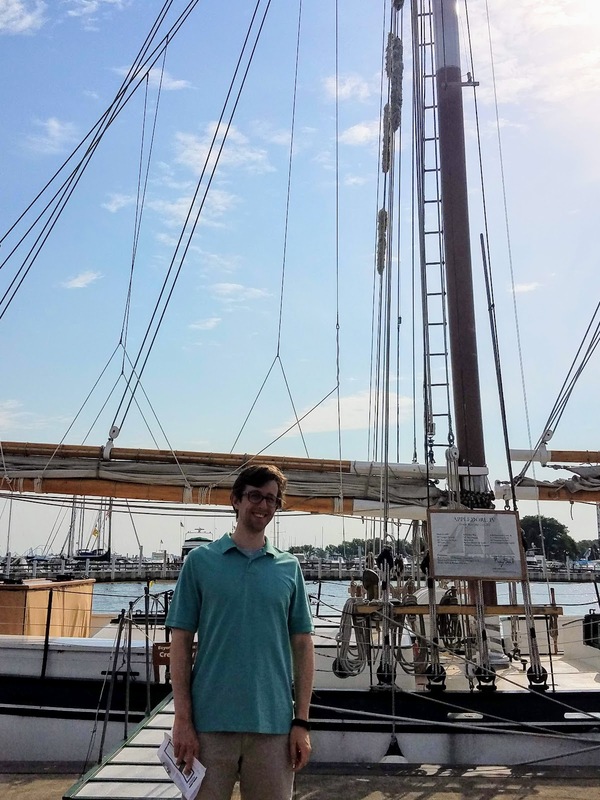 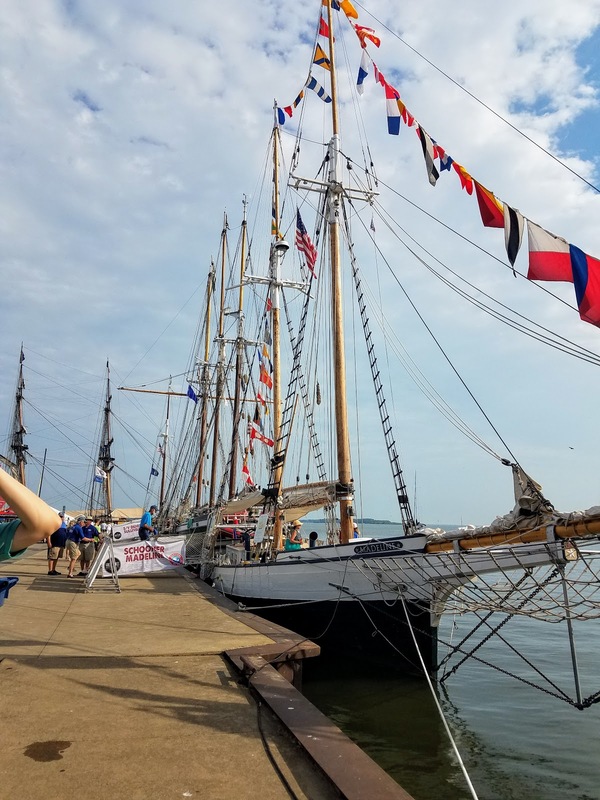 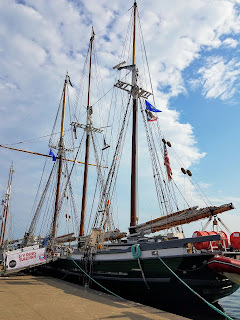 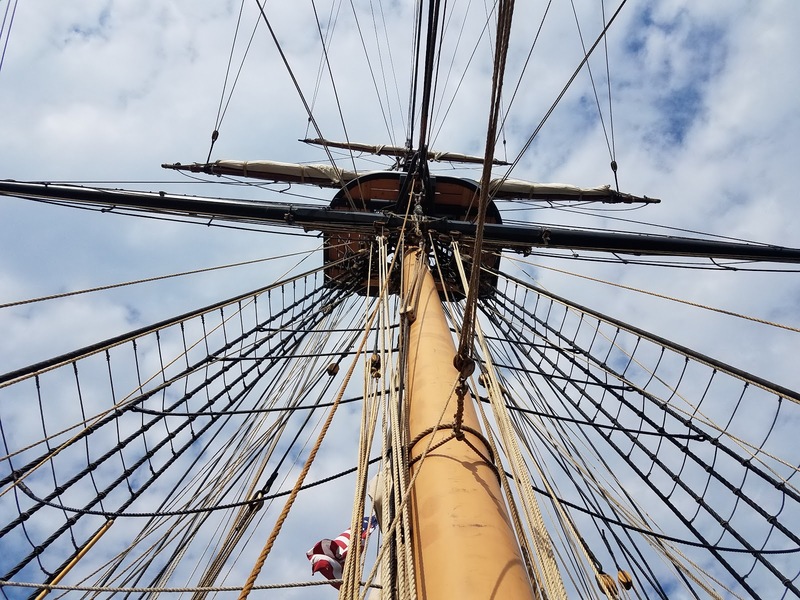 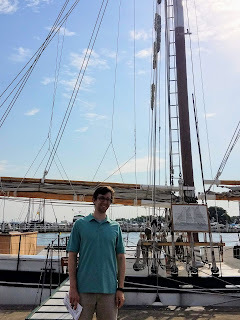 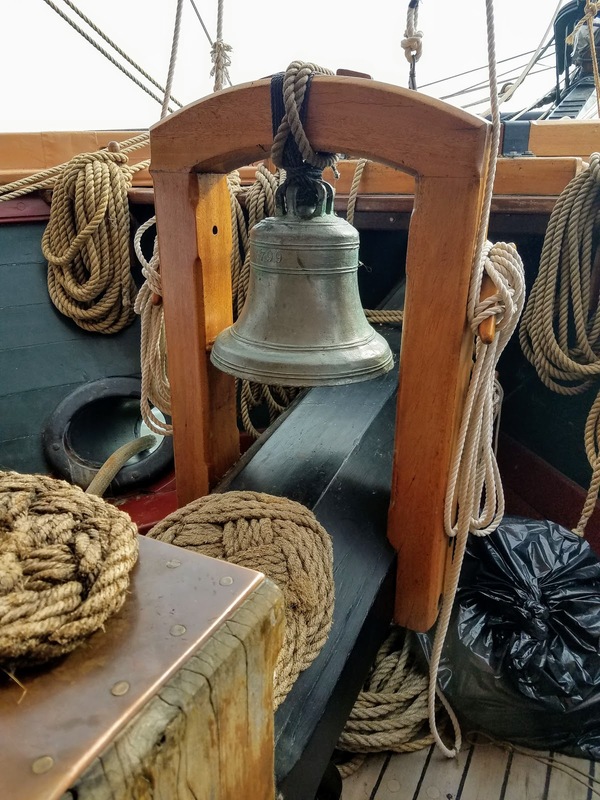 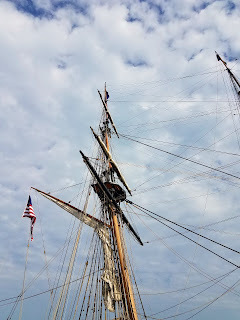 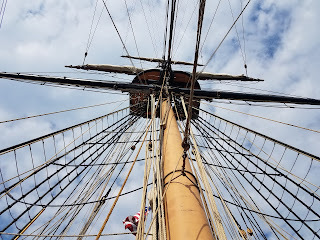 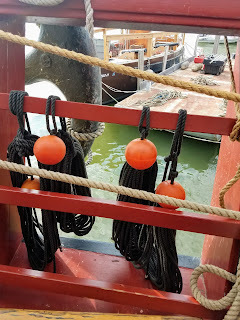 We boarded the U.S. Brig Niagara for our self-guided tour -- a reconstruction of the historic ship that Commodore Perry captained in the Battle of Lake Erie, a pivotal battle in the War of 1812. 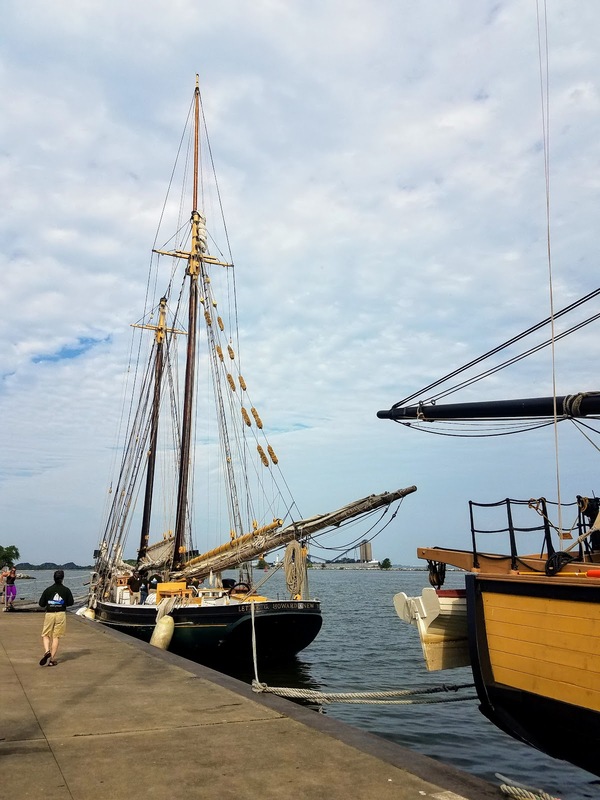 For those familiar with Great Lakes Beer and maybe not-so-much with Commodore Perry, the "don't give up the sip" quote on the beer of his namesake is modeled after his famous quote "don't give up the ship" prior to winning the battle and there is no shortage of Commodore Perry and shirts with "don't give up the ship" available at the Festival of Sail. 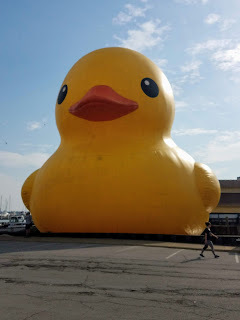 Per their website, the US. 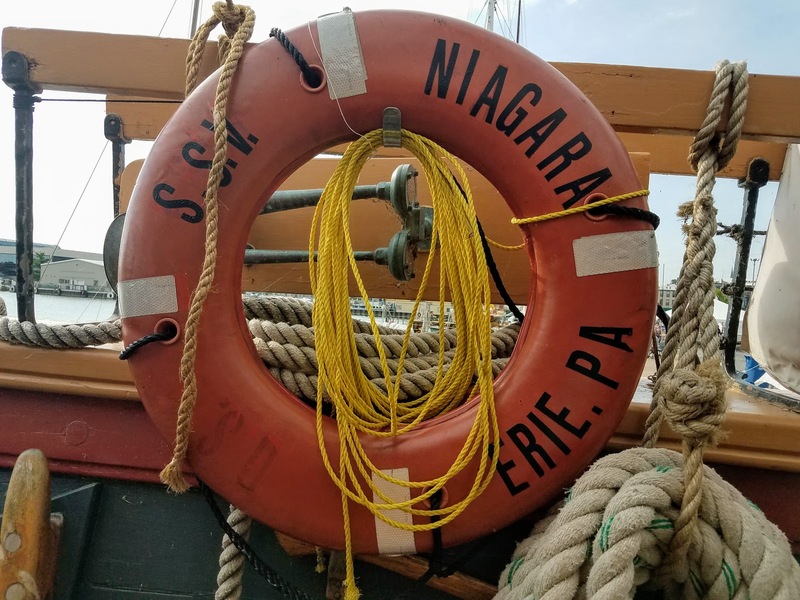 Brig Niagara is responsible for "preserving and interpreting the story of the Battle of Lake Erie, and acting as an ambassador in her capacity as the flagship of the Commonwealth of Pennsylvania. 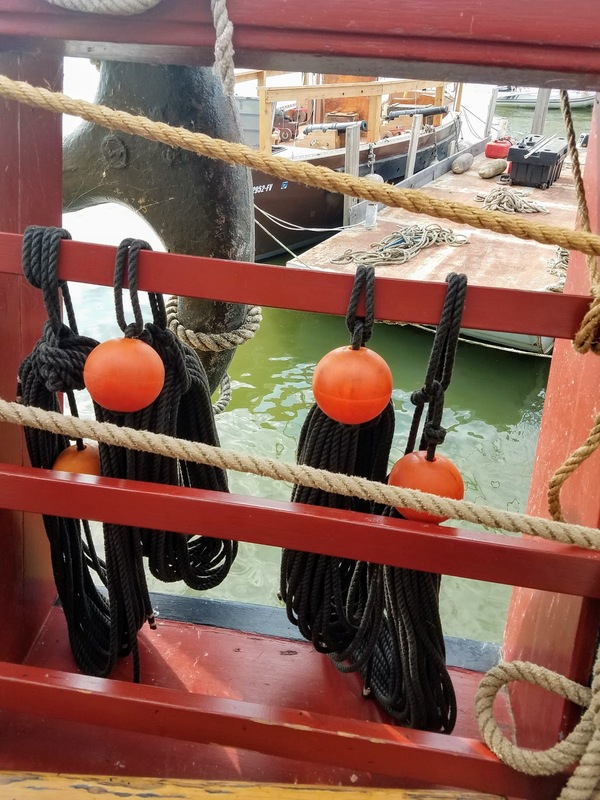 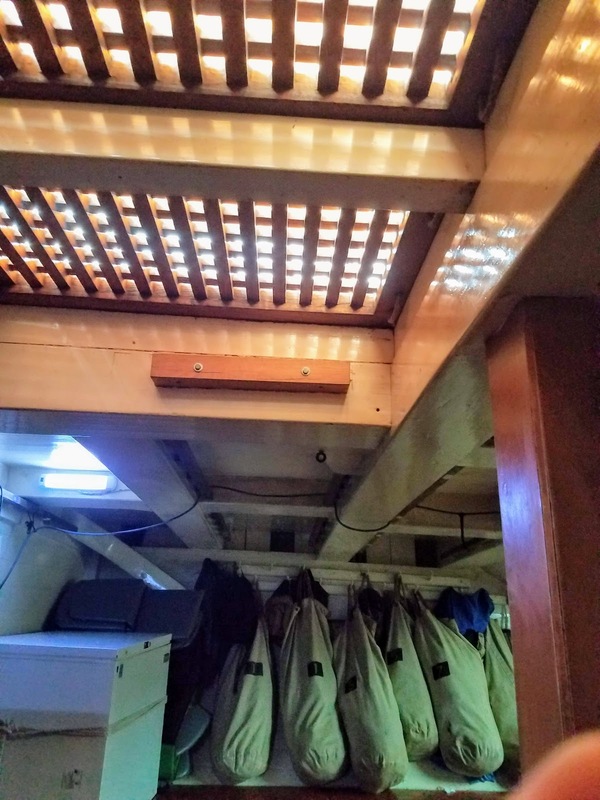 As a Sailing School Vessel, her crew of professionals and trainees actively preserve the skills of square-rig seamanship." 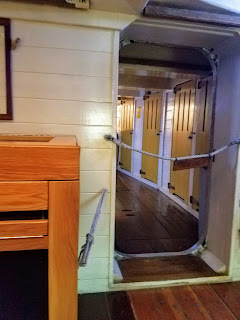 The height of the upper deck in some points was enough for me to fully stand while in the hull, but not enough for Dave. 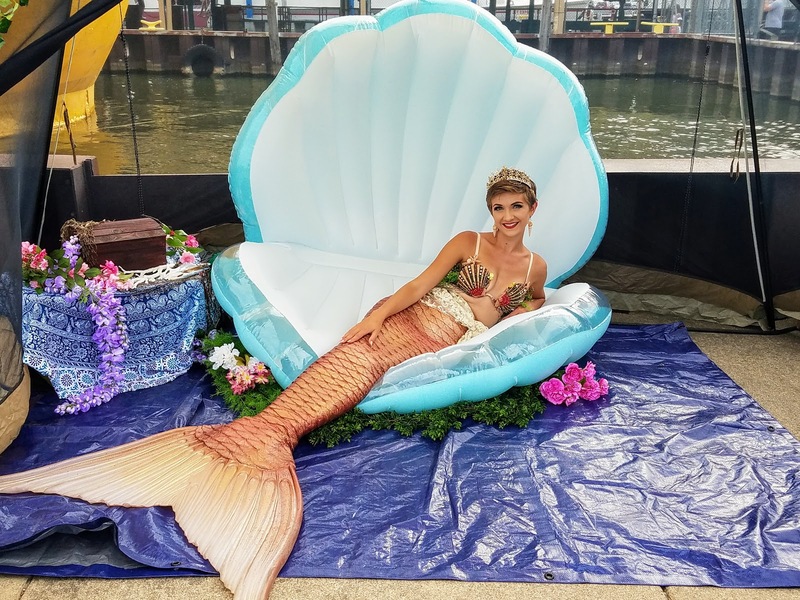 Katey Mermaid, Ohio's first mermaid, was on site for photo ops on Saturday and will be available for the full festival day on Sunday. 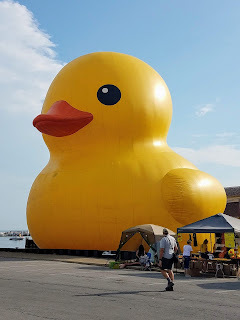 Great Lakes Brewing Company had a tent on-site along with plenty of food options. 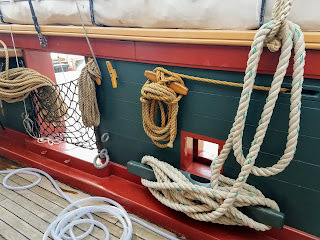 An events stage was set-up for evening entertainment, but due to the timing of our arrival it stood empty during the 45 minutes we were there. 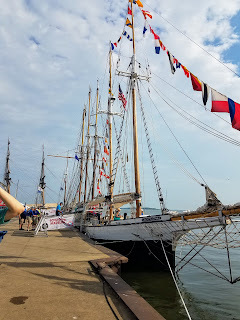 Overall, the pier where the festival is set-up is pretty small and it doesn't take very long to navigate. 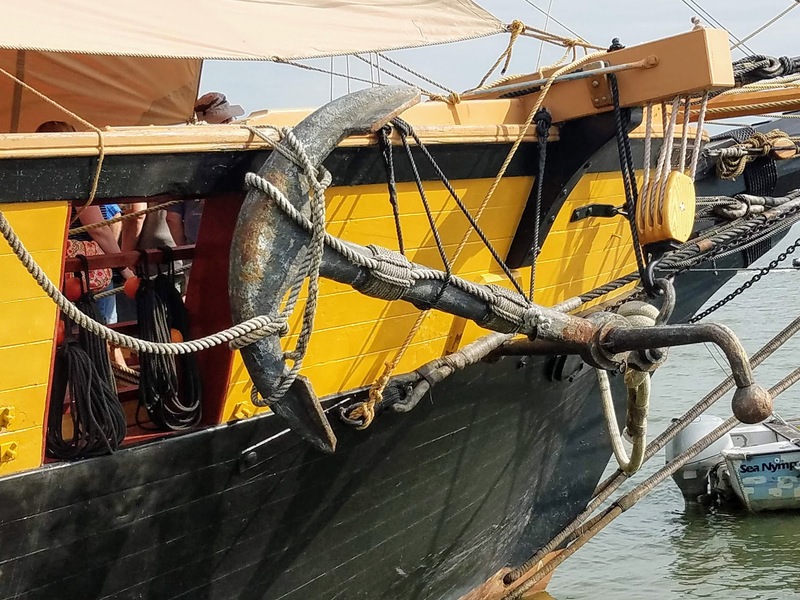 If you purchase tickets for a day tour you receive a 90 minute sailing tour which is more expensive, but might make the time in the festival area more worthwhile. 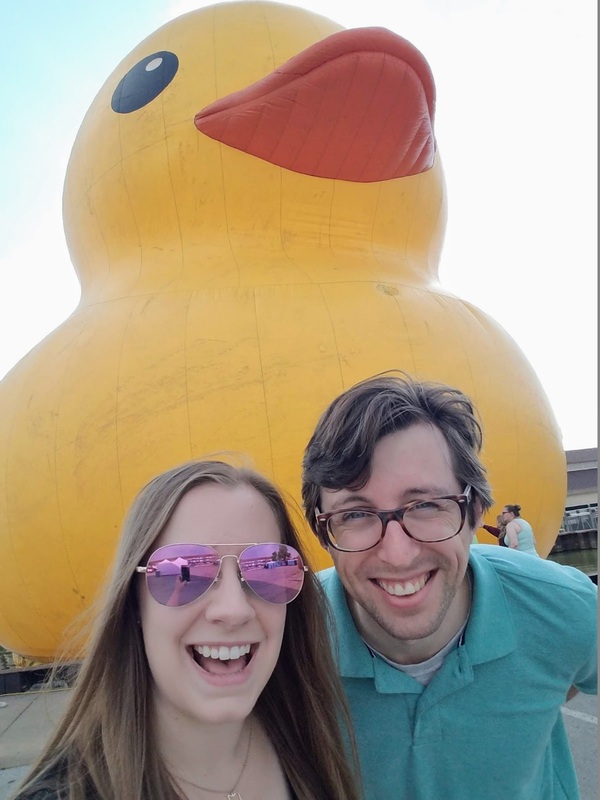 We both thought the money we spent to enter the festival was a worthwhile price, but without the addition of Mama Duck we wouldn't have gone to the lengths we did to fit this into our schedule with the 3+ hour round trip from home.